Colorado is full of scenic wonders, from soaring 14,000-foot peaks to mountain lakes and meadows to dramatic cliffs and canyons. But few people have access to the truly wild and remote regions of Colorado like those found along the route of the La Veta Pass route – a legendary pass in railroading circles that marks the highest point at which any standard gauge rail crosses the Rockies in Colorado. The La Veta Pass Route train departs daily at 9:30 in the morning from historic Alamosa and winds through country ranging from agricultural flatlands to colorful foothills to cliff-sided mountains – much of it inaccessible by motor vehicle – on its way to the charming art town of La Veta. A leisurely, ninety minute stop which allows passengers to relax in the park, do some shopping and gallery browsing, or enjoy a great meal at one of La Veta’s local restaurants and cafes. The train then departures La Veta at 2pm and arrives back in downtown Alamosa in time for dinner. By submitting this reservation request, you will be bound by the Terms and Conditions of Rio Grande Scenic Railroad and that of RailsNW. Let the Rio Grande Scenic Railroad take you on a relaxing journey over unique and stunning La Veta Pass. Our retro dome cars have seating in a glass sunlit dome top to take in all the beautiful scenery traveling over La Veta Pass in fully air-conditioned comfort. 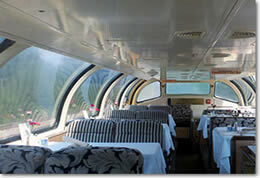 Our Club cars have a full-service bar and armchair – type seating and full air conditioning.